There is a secret to mastering French verbs. All the French kids do it! Follow my tips to understand how simple French verb conjugation can be! It’s no secret French verb conjugations are a pain. Even in the present tense of the indicative, there are many forms to memorize, no to mention all the irregular verbs conjugations. However, I have a tip for you that will make everything simpler! How do you think French children remember all these verb forms ? 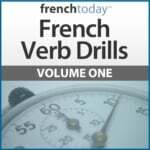 Most French verb methods will start by telling that in French, the verb ending will change according to the subject pronoun. Quite simple isn’t it compared to the French conjugation? The example of the verb “parler” was what we call “a regular verb” in French, verbs which follow the exact same conjugation pattern. Remove the “er” – this will give you what is called “the stem” in grammatical jargon. This is simple enough, and students spend hours upon hours writing these conjugations down. Grammar books have pages upon pages of them, for the present indicative tense but also all the other tenses and moods, and they promise that when you practice this way, you’ll master your French verb conjugations. The French verbs are classified among three groups of verbs whose conjugation pattern is “predictable”. EXCEPT that in French, we also have a ton of “irregular” verbs. Verbs whose conjugation pattern is either not at all predictable, or even sub-categories, several verbs which follow the same irregularity and therefore form a sub-group. So, the first French verb group ending in “ER” is somewhat solid. Many useful verbs are indeed conjugated according to this pattern. So, how does a student knows which “IR” verb is regular or not? When there are so many exceptions to a group, and the exceptions are the most useful verbs, should you still emphasis the group so much? Should students spend hours drilling on these “IR” and “RE” groups or rather spend that time drilling on the most common irregular verbs which they are certain they’re going to be using on an everyday basis? 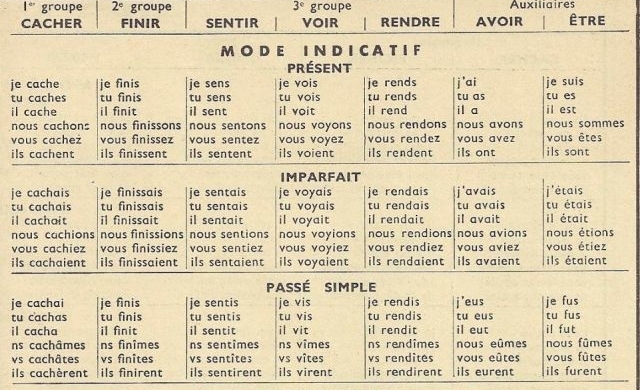 How do you think French children remember all these French verb conjugations ? If it was that difficult, they wouldn’t be able to talk at all! The secret, the one thing grammar method should actually focus on, is the correct French pronunciation of these verbs. Take the verb “parler” in the present tense. “Je, tu, il, elle, on, ils, elles” verb forms are all pronounced exactly the same = “parl”. Just like the stem. The “vous” form is pronounced “é”, just like the infinitive form of the verb “parler”. So “parlez = parler = parlé” in pronunciation. French is a living language. People use it everyday to communicate. I’m not saying it’s an easy language, but it’s easier than the traditional way of teaching it! They are all pronounced the same way. So when you are talking, you should not even think about doing an agreement there. It’s only in writing that it’s important. You should first learn to speak French. Pronounce it properly. Then (and only if you need to) focus on writing the verb form in French! That’s exactly how French kids do it. If more focus was placed on the French verb pronunciation, I wouldn’t hear so many students pronounce the silent “ent” of the “ils/elles” forms of French verbs. However it is one of the most common mistakes I hear! You have no idea the number of advanced French students that butcher their French verbs! And don’t even get me started on the liaisons and silent letters. Did you know that the S of “nous” and “vous” is NEVER pronounced like an S? Never ever, ever! And then learned the French verbs requiring elision and elision with their correct pronunciation right away. So, you could say that audio is kind of a new thing, that up to now, most books didn’t have audio and that’s why they were written this way. It’s true that nowadays, in my opinion, it’s a crime to develop a French learning method without audio. However look at this present article. Unlike all my downloadable French audiobooks, this article doesn’t have audio, does it? Yet I could make my point across. It’s a question of thinking outside the box. This being said, each French student should have a Bescherelles or other French verb book to check the way a French verb is spelled. It’s a good investment because if you plan on writing French, you’ll need such a book: we all do (it’s a requirement even for every French school kid)! I’m not saying that all the other French learning methods are wrong. Then content is correct, or course. It’s the approach that is wrong. Traditional methods still teach French to foreigners the same exact way they teach French children. But there is a huge difference. French children know how to speak before they learn how to write! A five years old would discover with surprise that the “tu” form usually takes an “s”. It’s all news to him/her as well! And teachers will correct that mistake for years on, believe me. So of course, our adult mind doesn’t work like the one of a toddler. And knowing grammar can and will actually help you master French: I strongly believe it’s actually essential to master French. And it will allow you to save time. However, if you are learning French to communicate in French, and not only to pass written exams, you really need to learn everything with audio, and examine the logic of the teaching methods you are using. Always drill with the verb and the pronoun at the same time. The two should come naturally together with the correct elision, liaison or gliding. Drill in the negative as well so you don’t have to “build” your negative form and it comes quickly to you. Same for the inversion of the interrogative. Truly understand when to use the French tenses and moods. A beginner has no need to learn the French subjunctive. It should not be its priority yet. Stay in the present indicative tense for now = it’s the most used tense (it may even accidentally work for the subjunctive since they often have the same verb form) !! This is exactly the logic I applied in my unique audiobooks French Verb Conjugation Drills. If you believe all French people understand French conjugation, and know when to use the subjunctive, for example, you are mistaken. Instead, we rely on our French ear. It’s because we know how to speak the language that we can write it correctly. Il faut que tu aies du courage = You need to be courageous. I’m going to be very tempted to write “il faut que tu es du courage”. Why? Because “tu es” is widely used, and it sounds the same way as “tu aies”. Ok, it’s not the same mood (indicative ≠ subjunctive). It’s not even the same verb! (être versus avoir) but it’s such a strong habit to write “tu es” that it’s actually a very common mistake. Il faut que tu saches… for example. Even if the rest of the sentence doesn’t work with “savoir”, since it’s the “il faut que” that triggers the subjunctive, it’s enough. A French person should know the rule. But more often than not, we’ll rely on tricks to find out the right tense. If what I’ve explained in this article rings a bell, then I encourage you to sample my audiobooks to learn French: click the links below to hear an audio sample, read the description and access a table of content. 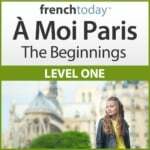 The A Moi Paris series is a complete French learning method illustrated by a lively novel, to master both traditional and spoken modern French, organized by levels and starting at a true beginner level. This series explains it all: vocabulary, sentence structure, and of course also the French tenses, how to build them and when to use them. The French verb drills are a revolutionary method to memorize the French verb forms, master their correct pronunciation and gain speed and confidence when speaking French. You may also be interested in my article on how to choose the best learning method and avoid scams.